Santa Fe (; (Tewa: Ogha Po'oge, Navajo: Yootó)) is the capital of the state of New Mexico. It is the fourth-largest city in the state and is the seat of Santa Fe County. 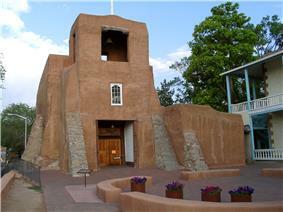 Santa Fe is the oldest capital city in the United States and the oldest city in New Mexico. 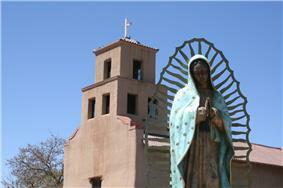 Santa Fe (meaning “holy faith” in Spanish) had a population of 69,204 in 2012. It is the principal city of a Metropolitan Statistical Area which encompasses all of Santa Fe County and is part of the larger Albuquerque-Santa Fe-Las Vegas Combined Statistical Area. The city’s full name when founded was La Villa Real de la Santa Fe de San Francisco de Asís (“The Royal Town of the Holy Faith of St. Francis of Assisi”). Santa Fe settlers are “churlish types” who are “accustomed to live apart from each other, as neither fathers nor sons associate with each other." —Governor Fermín de Mendinueta, c. 1776. The city of Santa Fe was originally occupied by a number of Pueblo Indian villages with founding dates between 1050 to 1150. One of the earliest known settlements in what today is downtown Santa Fe came sometime after 900. A Native American group built a cluster of homes that centered around the site of today’s Plaza and spread for half a mile to the south and west; the village was called Ogapoge. The Santa Fe River provided water to people living there. The Santa Fe River is a seasonal waterway which was a year round stream until the 1700s. As of 2007, the river was recognized as the most endangered river in the United States, according to the conservation group American Rivers. Don Juan de Oñate led the first effort to colonize the region in 1598, establishing Santa Fe de Nuevo México as a province of New Spain. Under Juan de Oñate and his son, the capital of the province was the settlement of San Juan de los Caballeros north of Santa Fe near modern Ohkay Owingeh Pueblo. New Mexico's second Spanish governor, Don Pedro de Peralta, however, founded a new city at the foot of the Sangre de Cristo Mountains in 1607, which he called La Villa Real de la Santa Fe de San Francisco de Asís, the Royal Town of the Holy Faith of Saint Francis of Assisi. In 1610, he made it the capital of the province, which it has almost constantly remained, making it the oldest state capital in the United States. Except for the years 1680–1692, when, as a result of the Pueblo Revolt, the native Pueblo people drove the Spaniards out of the area known as New Mexico, later to be reconquered by Don Diego de Vargas, Santa Fe remained Spain's provincial seat until the outbreak of the Mexican War of Independence in 1810. In 1824 the city's status as the capital of the Mexican territory of Santa Fe de Nuevo México was formalized in the 1824 Constitution. The Republic of Texas had claimed Santa Fe as part of the western portion of Texas along the Rio Grande when it seceded from Mexico in 1836. In 1841, a small military and trading expedition set out from Austin, Texas, with the aim of gaining control over the Santa Fe Trail. Known as the Santa Fe Expedition, the force was poorly prepared and was easily captured by the Mexican army. In 1846, the United States declared war on Mexico, and Brigadier General Stephen W. Kearny led the main body of his Army of the West of some 1,700 soldiers into the city to claim it and the whole New Mexico Territory for the United States. By 1848 the U.S. officially gained New Mexico through the Treaty of Guadalupe Hidalgo. Colonel Alexander William Doniphan, under the command of Kearny, recovered ammunition from Santa Fe labeled "Spain 1776", showing both the quality of communication and military support New Mexico received under Mexican rule. "I can hardly imagine how Santa Fe is supported. The country around it is barren. At the North stands a snow-capped mountain while the valley in which the town is situated is drab and sandy. The streets are narrow... A Mexican will walk about town all day to sell a bundle of grass worth about a dime. They are the poorest looking people I ever saw. They subsist principally on mutton, onions and red pepper." In 1851, Jean Baptiste Lamy arrived; in 1853 he became bishop of New Mexico, Arizona, Utah, and Colorado and traveled to France, Rome, Tucson, Los Angeles, St. Louis, New Orleans and Mexico City. He built Saint Francis Cathedral and shaped Catholicism in the region until his death in 1888. For a few days in March 1862, the Confederate flag of General Henry Sibley flew over Santa Fe, until he was forced to withdraw by Union troops, who destroyed his logistical trains following the battle of Glorietta Pass. On October 21, 1887, "The Padre of Isleta", Anton Docher went to New Mexico where he was ordained as a priest in the St Francis Cathedral of Santa Fe by Bishop Jean-Baptiste Salpointe. After a few years spent in Santa Fe, Bernalillo and in Taos, he arrived in Isleta on December 28, 1891. He wrote an interesting ethnological article published in The Santa Fé Magazine on June,1913, in which he describes the early 20th century's life in the Pueblos. Santa Fe was originally envisioned as an important stop on the Atchison, Topeka and Santa Fe Railway. But as the tracks progressed into New Mexico, the civil engineers decided that it was more practical to go through Lamy, a town in Santa Fe County to the south of Santa Fe. A branch line was completed from Lamy to Santa Fe in 1880 and the Denver and Rio Grande Western Railroad extended the narrow gauge Chili Line from the nearby city of Española to Santa Fe in 1886, but the result of bypassing Santa Fe was a gradual economic decline. This was reversed in part through the creation of a number of resources for the arts and archaeology, notably the School of American Research, created in 1907 under the leadership of the prominent archaeologist Edgar Lee Hewett. The first airplane to fly over Santa Fe was piloted by Rose Dugan, carrying Vera von Blumenthal as passenger. Together they started the development of the Pueblo Indian pottery industry, a major contribution to the founding of the annual Santa Fe Indian Market. 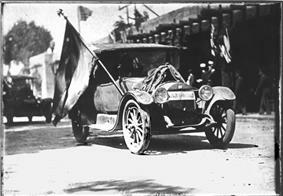 In 1912, New Mexico became the United States of America's 47th state, with Santa Fe as its capital. In 1912, when the town had only 5,000 people, the city's civic leaders designed and enacted a sophisticated city plan that incorporated elements of the City Beautiful movement, the city planning movement, and the German historic preservation movement. It anticipated limited future growth, considered the scarcity of water, and recognized the future prospects of suburban development on the outskirts. The planners foresaw conflicts between preservationists and scientific planners. They set forth the principle that historic streets and structures be preserved and that new development must be harmonious with the city's character. The mainline of the railroad bypassed Santa Fe, and it lost population. However artists and writers, as well as retirees, were attracted to the cultural richness of the area, the beauty of the landscapes and its dry climate. Local leaders began promoting the city as a tourist attraction. 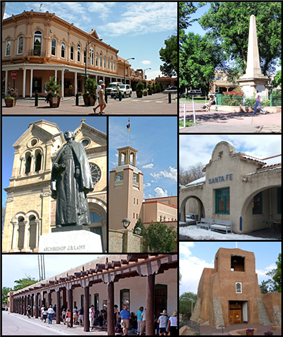 The city sponsored architectural restoration projects and erected new buildings according to traditional techniques and styles, thus creating the "Santa Fe style". Edgar L. Hewett, founder and first director of the School of American Research and the Museum of New Mexico in Santa Fe, was a leading promoter. He began the Santa Fe Fiesta in 1919 and the Southwest Indian Fair in 1922 (now known as the Indian Market). When he tried to attract a summer program for Texas women, many artists rebelled saying the city should not promote artificial tourism at the expense of its artistic culture. 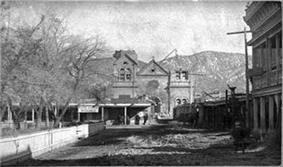 The writers and artists formed the Old Santa Fe Association and defeated the plan. During World War II, Santa Fe was the location of a Japanese American internment camp. Beginning in June 1942, the Department of Justice held 826 Japanese American men arrested after Pearl Harbor in a former Civilian Conservation Corps site that had been acquired and expanded for the purpose. Although there was a lack of evidence and no due process, the men were held on suspicion of fifth column activity. Security at Santa Fe was similar to a military prison, with twelve-foot barbed wire fences, guard towers equipped with searchlights, and guards carrying rifles, side arms and tear gas. By September, the internees had been transferred to other facilities — 523 to War Relocation Authority concentration camps, 302 to Army internment camps — and the site was used to hold German and Italian nationals. In February 1943, these civilian detainees were transferred to D.O.J. custody and the camp was expanded to take in 2,100 men segregated from the general population of Japanese American inmates, mostly Nisei and Kibei who had renounced their U.S. citizenship and other "troublemakers" from the Tule Lake Segregation Center. In 1945, four internees were seriously injured when violence broke out between the internees and guards in an event known as the Santa Fe Riot. The camp remained open past the end of the war; the last detainees were released in mid 1946, and the facility was closed and sold as surplus soon after. The camp was located in what is now the Casa Solana neighborhood. Santa Fe is located at 7,199 feet (2134 m) above sea level, making it the highest state capital in the United States. Santa Fe experiences a semi-arid climate (Köppen BSk), with chilly winters, and very warm summers. The 24-hour average temperature in the city ranges from 30.3 °F (−0.9 °C) in December to 70.1 °F (21.2 °C) in July. Due to the relative aridity and elevation, average diurnal temperature variation exceeds 25 °F (14 °C) in every month, and 30 °F (17 °C) much of the year. The city usually receives 6 to 8 snowfalls a year between November and April. Heaviest rainfall occurs in July and August, with the arrival of the North American Monsoon. In a September 2003 report by Angelou Economics, it was determined that Santa Fe should focus their economic development efforts in the following seven industries: Arts and Culture, Design, Hospitality, Conservation Technologies, Software Development, Publishing and New Media, and Outdoor Gear and Apparel. Three secondary targeted industries for Santa Fe to focus development in are health care, retiree services, and food & beverage. Angelou Economics recognized three economic signs that Santa Fe’s economy was at risk of long term deterioration. These signs were; a lack of business diversity which tied the city too closely to fluctuations in tourism and the government sector; the beginnings of urban sprawl, as a result of Santa Fe County growing faster than the city, meaning people will move farther outside the city to find land and lower costs for housing; and an aging population coupled with a rapidly shrinking population of individuals under 45 years old, making Santa Fe less attractive to business recruits. In 2005/2006, a consultant group from Portland, Oregon, prepared a “Santa Fe Downtown Vision Plan” to examine the long-range needs for the “downtown” area, roughly bounded by the Paseo de Peralta on the north, south and east sides and by Guadalupe Street on the west. In consultation with members of community groups, who were encouraged to provide feedback, the consultants made a wide range of recommendations in the plan now published for public and city review. The Joseph M. Montoya Federal Building and Post Office serves as an office for U.S. federal government operations. It also contains the primary United States Postal Service post office in the city. Other post offices in the Santa Fe city limits include Coronado, De Vargas Mall, and Santa Fe Place Mall. The U.S. Courthouse building, constructed in 1889, was added to the National Register of Historic Places in 1973. The city and the surrounding areas have a high concentration of artists. They have come over the decades to capture the natural beauty of the landscape, the flora and the fauna. One of the most well-known New Mexico–based artists was Eliot Porter, died in Santa Fe. 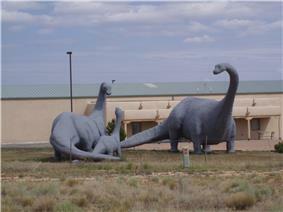 Dinosaur family sculpture, south of I-25 off Cerrillos Road, 2008. Numerous authors followed the influx of specialists in the Mitch Cullin, Evan S. Connell, Richard Bradford, John Masters, Jack Schaefer, Michael Tobias, Hampton Sides and Michael McGarrity are or were residents of Santa Fe. Walker Percy lived on a dude ranch outside of Santa Fe before returning to Louisiana to begin his literary career. Performance Santa Fe, formerly the Santa Fe Concert Association, is the oldest presenting organization in Santa Fe. Founded in 1937, Performance Santa Fe brings celebrated and legendary musicians as well as some of the world’s greatest dancers and actors to the city from August through May. 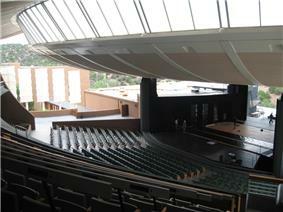 The Santa Fe Opera's productions take place between late June and late August each year. The city also hosts the Santa Fe Chamber Music Festival which is held at about the same time, mostly in the St. Francis Auditorium and in the Lensic Theater. Also in July and August, the Santa Fe Desert Chorale holds its summer festival. Santa Fe has its own professional ballet company, Aspen Santa Fe Ballet, which performs in both cities and tours nationally and internationally. Santa Fe is also home to internationally acclaimed Flamenco dancer's Maria Benitez Institute for Spanish Arts which offers programs and performance in Flamenco, Spanish Guitar and similar arts year round. Other notable local figures include the National Dance Institute of New Mexico and German New Age musician Deuter. New Mexico Museum of Art – collections of Southwestern Arts. Institute of American Indian Arts Museum – Native American arts with political aspects. Pablita Velarde Museum of Indian Women in the Arts - a museum dedicated to Native Women artists. Santa Fe has had an association with science and technology since 1943 when the town served as the gateway to Los Alamos National Laboratory (LANL), a 45 minute drive from the city. In 1984, the Santa Fe Institute (SFI) was founded to research complex systems in the physical, biological, economic, and political sciences. It hosts such Nobel laureates as Murray Gell-Mann (physics), Philip Warren Anderson (physics), and Kenneth Arrow (economics). The National Center for Genome Resources (NCGR) was founded in 1994 to focus on research at the intersection among bioscience, computing, and mathematics. In the 1990s and 2000s several technology companies formed to commercialize technologies from LANL, SFI, and NCGR. This community of companies has been dubbed the "Info Mesa." After State government, tourism is a major element of the Santa Fe economy, with visitors attracted year-round by the climate and related outdoor activities (such as skiing in years of adequate snowfall; hiking in other seasons) plus cultural activities of the city and the region. Tourism information is provided by the convention and visitor bureau and the chamber of commerce. Most tourist activity takes place in the historic downtown, especially on and around the Plaza, a one-block square adjacent to the Palace of the Governors, the original seat of New Mexico's territorial government since the time of Spanish colonization. Other areas include “Museum Hill”, the site of the major art museums of the city as well as the Santa Fe International Folk Art Market, which takes place each year during the second full weekend of July. The Canyon Road arts area with its galleries is also a major attraction for locals and visitors alike. Popular day-trips in the Santa Fe area include locations such as the town of Taos – about 70 mi (113 km) north of Santa Fe. The historic Bandelier National Monument and the Valles Caldera can be found about 30 mi (48 km) away. 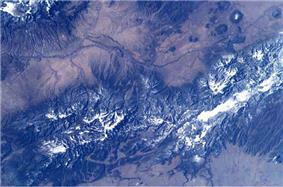 In addition, Santa Fe's ski area, Ski Santa Fe, is about 16 mi (26 km) north of the city. Santa Fe Trails operates a number of bus routes within the city and also provides connections to regional transit. New Mexico Park and Ride, a division of the New Mexico Department of Transportation, and the North Central Regional Transit District operate primarily weekday commuter coach/bus service to Santa Fe from Torrance, Rio Arriba, Taos, San Miguel and Los Alamos Counties in addition to shuttle services within Santa Fe connecting major government activity centers. Prior to the Rail Runner's extension to Santa Fe, New Mexico Park and Ride operated commuter coach service between Albuquerque and Santa Fe. The public schools in Santa Fe are operated by Santa Fe Public Schools, The city has three private liberal arts colleges: St. John's College, Santa Fe University of Art and Design (formerly the College of Santa Fe), and Southwestern College; plus Santa Fe Community College and the Institute of American Indian Arts. The city has six private college preparatory high schools: Santa Fe Waldorf School, St. Michael's High School, Desert Academy, New Mexico School For The Deaf, Santa Fe Secondary School, and Santa Fe Preparatory School. Santa Fe is home to the Santa Fe Indian School, an off-reservation school for Native Americans. Santa Fe is also the location of the New Mexico School for the Arts, a public-private partnership, arts-focused, high school. There are also several charter schools, including Monte del Sol, the Academy for Technology and the Classics and Tierra Encantada Charter High School. The city has many private elementary schools as well, including Little Earth, Santa Fe International Elementary School, Rio Grande School, Desert Montessori School, La Mariposa Montessori,The Tara School, Fayette Street Academy, and The Santa Fe Girls' School.The Academy for the Love of Learning located in southeast Santa Fe. ^ "Census 2010 News | U.S. Census Bureau Delivers New Mexico's 2010 Census Population Totals, Including First Look at Race and Hispanic Origin Data for Legislative Redistricting". 2010.census.gov. 2011-03-15. Retrieved 2012-05-16. ^ "Santa Fe (New Mexico, United States) – Britannica Online Encyclopedia". Britannica.com. Retrieved May 31, 2011. ^ "Ojo Caliente Land Grant". New Mexico Office of the State Historian. Retrieved May 8, 2009. ^ Hazen-Hammond, Susan (1988). A Short History of Santa Fe. San Francisco: Lexikos. p. 132. ^ Handwerk, Brian. "Santa Fe Tops 2007 List of Most Endangered Rivers". National Geographic. Retrieved April 24, 2011. ^ "Santa Fe – A Rich History". City of Santa Fe. Retrieved October 12, 2008. ^ Garrard, Lewis H. (1955) . Wah-to-yah and the Taos Trail. Norman, Oklahoma: University of Oklahoma Press. ^ Letter in The Arkansas Banner, 8-31-1849 in Marta Weigle; Kyle Fiore (2008). Santa Fe and Taos: The Writer's Era, 1916-1941. Sunstone Press. p. 3. ^ Anton Docher. The Quaint Indian Pueblo of Isleta.The Santa Fé Magazine,1913,vol.7,n°7,p.29-32. ^ "Santa Fe Southern Railway, Santa Fe, NM". Sfsr.com. Retrieved May 31, 2011. ^ "Santa Fe, NM". Ghostdepot.com. Retrieved May 31, 2011. ^ a b Jeffrey Burton, Mary Farrell, Florence Lord, Richard Lord. Confinement and Ethnicity: An Overview of World War II Japanese American Relocation Sites: "Department of Justice Internment Camps: Santa Fe, New Mexico" National Park Service, 2000 (accessed 19 Mar 2013). ^ "Station Name: NM SANTA FE 2". National Oceanic and Atmospheric Administration. Retrieved 2013-06-29. ^ "Monthly Averages for Santa Fe, NM". The Weather Channel. Retrieved September 25, 2010. ^ Hammett, p.15: "They ripped off the cast-iron storefronts, tore down the gingerbread trim, took off the Victorian brackets and dentils..."
^ "Cultivating Santa Fe’s Future Economy: Target Industry Report". Angelou Economics. Retrieved April 24, 2011. ^ "Santa Fe Downtown Vision Plan". March 2007. Retrieved Dec 26, 2012. ^ "Elected Officials - City of Santa Fe". santafenm.gov. Retrieved 11 July 2014. ^ "City Attorney". City of Santa Fe. Retrieved 11 July 2014. 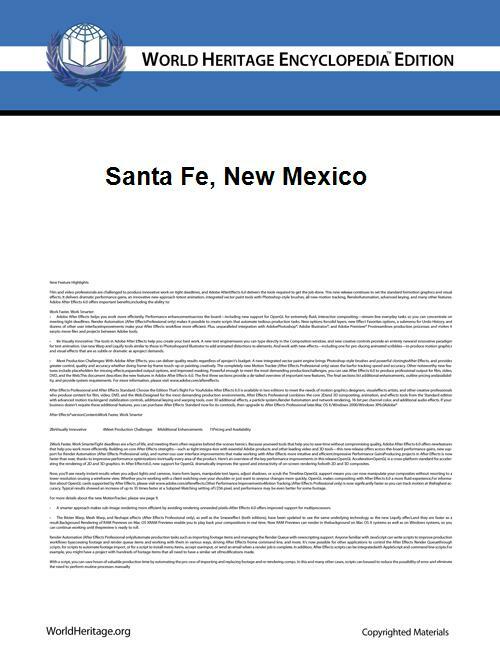 ^ a b c d e "Santa Fe Municipal Charter" (PDF). City of Santa Fe. March 4, 2008. Retrieved October 15, 2008. ^ "Post Office Location – Santa Fe main". United States Postal Service. Retrieved July 5, 2009. ^ "Post Office Location – Coronado". United States Postal Service. Retrieved June 6, 2009. ^ "Post Office Location – De Vargas Mall". United States Postal Service. Retrieved June 6, 2009. ^ "Post Office Location – Santa Fe Place Mall". United States Postal Service. Retrieved June 6, 2009. 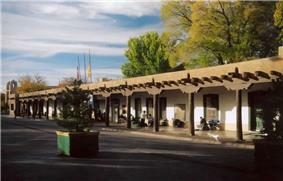 ^ "Santa Fe, United States UNESCO City of Design, Crafts and Folk Art". unesco.org. United Nations Education, Science and Cultural Organization. 2008-09-28. Retrieved 2013-05-21. ^ "Museum of Spanish Colonial Art homepage". ^ "Santa Fe Rodeo". rodeosantafe.org. ^ "National Center for Genome Resources". Ncgr.org. Retrieved May 31, 2011. ^ "Complex Systems Summer School". Santafe.edu. Retrieved May 31, 2011. ^ "Center For Nonlinear Studies". ^ Shukman, Henry (February 7, 2010). 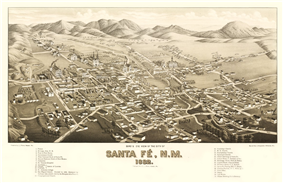 "Santa Fe, N.M., and How It Came to Be as It is". New York Times. Retrieved February 7, 2010. 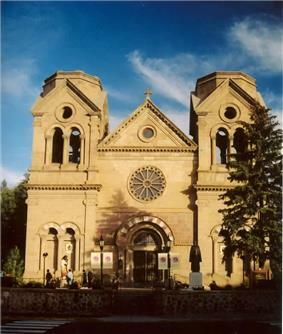 ^ "Santuario de Guadalupe, Santa Fe, New Mexico". Waymarking.com. Retrieved 2012-05-16. ^ "Santa Fe.org". Santa Fe.org. February 3, 2011. Retrieved May 31, 2011. ^ "Santa Fe Chamber of Commerce". Santafechamber.com. Retrieved May 31, 2011. ^ "Santa Fe (city), New Mexico". State & County QuickFacts. U.S. Census Bureau. ^ "Sister Cities". The Official Website of Santa Fe, New Mexico. Retrieved 2014-08-05. ^ "Restored flights to Denver lift mayor's State of the City address". ^ "Airline Service For New Mexico Capital In Limbo". aero-news.net. November 13, 2007. ^ Description and Historic Context for Pre-1937 Highway Alignments at U.S. National Park Service website, excerpted from Kammer, David, "Route 66 Through New Mexico: Re-Survey Report". ^ "New Mexico Park and Ride Schedule". New Mexico Department of Transportation. December 22, 2008. Retrieved March 23, 2009. ^ "NCRTD Bus Routes Overview". North Central Regional Transportation District. Retrieved March 23, 2009. ^ "Dale Ball Trails and Connecting Trails and Biking Trails". Santafenm.gov. Retrieved May 31, 2011. ^ "Santa Fe Waldorf School K–12". ^ "Santa Fe International Elementary School K–8".